Last year was an interesting year in Android phones and not just thanks to Samsung’s unfortunate Note 7 debacle. Modular phones came and mostly went and, more importantly, Google released the Pixel, the phone by which all other Android phones would (and should) be judged. Somewhat ironically, if it weren’t for my tragically brief love affair with the Note 7, I might not have even bothered to check the Pixel out. But I did and it changed how I looked at other phones. Fast forward to this year, Samsung is back with a new Note to complete the 2017 Galaxy line. The Galaxy S8+ didn’t do much for me. It was sleek and so very pretty, but I still preferred the straight up unvarnished Android OS, along with the boxy, bezeled design of the Pixel. The sleek curved “infinity” screen of the S8 drove me nuts with unwanted interactions nearly every time I held the thing. The fingerprint scanner worked unreliably and for some reason, even just waking the screen up took entirely too many swipes. So, with a laundry list of criticisms for the S8, I’m still somewhat perplexed as to why I love the Note 8 so damn much. Enough for it to seriously make me contemplate switching from my beloved Pixel. The Note 8 still has that curved bezel-less design, the fingerprint reader is still a small rectangular box on the back, and the interface isn’t especially different than the S8 before it. 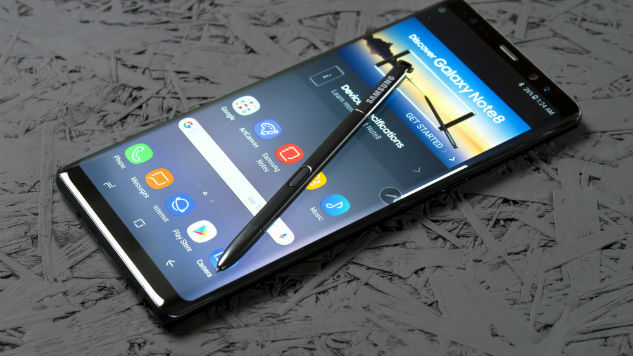 Shouldn’t the Note 8 just be the same as the S8+ with a stylus added? Maybe, but it’s not. The Note 8 is an amazing middle ground between caution and innovation. There’s nothing groundbreaking here, but the phone as a whole is simply one of, if not the best mobile device I’ve ever used. Of course, that praise hinges on how you feel about the so-called phablet and stylus-centric design. If you hate big phones and don’t see the benefit of a stylus, go ahead and move along. There are several key reasons why the Note 8 is not just better than the Galaxy S8, but any other recent phone I’ve used. While the Note 8 uses nearly the same screen as the S8+, it’s a hair larger at 6.3 inches. The Super AMOLED WQHD+ screen still sports the S8+’s 1440×2960 resolution Infinity display, but it’s absurdly, wonderfully bright and HDR-certified so colors pop beautifully with supported content (such as Netflix’s ever growing selection). That brightness makes a huge difference in screen enjoyment, especially when coupled with Samsung’s subtle and under-appreciated auto brightness settings. The phone quietly learns your brightness preferences at various light levels. It will auto-dim in the dark, but in full sunlight at full brightness, this is one of the few phones that is easy to read. Samsung is understandably paranoid about the battery in their Note line and this year’s Note actually uses a smaller battery than either the Note 7 or the S8+ (3,300mAh versus the S8+’s 3,500mAh). Yet, surprisingly, in my testing it’s actual battery life does a bit better than the S8+ and the phone easily lasts a whole day on a charge. The stylus functionality has been expanded in some fun, if somewhat superfluous directions. You can know jot down notes without even unlocking the phone, just by pressing the tip of the stylus down on the lock screen. The size of notes you can take has been greatly expanded and there’s also the entertaining new ‘Live’ message feature that lets you send small hand drawn, animated messages. While the Note 8 uses the same processor as the S8, it does get two more GB of RAM (for a total of six), though overall performance is largely the same. Where hardware has been noticeably improved is the camera. The Note 8 has a two-lens setup that actually allows for two levels of true optical zoom, which makes a huge difference in the shots you can take. Whether manually adjusting or using the “live focus” feature, I’ve never had a camera phone that can take close-ups like the Note 8. Both lens use Samsung’s new optical image stabilization technology and the result is far fewer blurry pictures than I’m used to. The overall quality of pictures is superb. Colors are gorgeous and images are sharper than ever. So, for those who really love taking high quality pics on their phones, this is the new benchmark. Since unlocking phones with your face is apparently a hot topic lately, it’s a good time to note (get it?) that Samsung lets you unlock your phone with your face, your fingerprint, or your retina. Best of all, any of those methods are entirely optional. You can just use a PIN or swiping symbol if you like. It doesn’t have the insane 3D mapping technology that the iPhone X claims, but it’s a nice alternative to the awkwardly placed fingerprint scanner. I still much prefer the Pixel’s logically round and impeccably reliable fingerprint reader to the Note’s rectangular scanner unfortunately positioned right next to the back camera. This year’s scanner does work better than previous iterations though, but still wasn’t perfect. Also, the addition of a Bixby button on the side of the phone is perplexing and unnecessary. Google users didn’t need yet another “smart” assistant to begin with and I found myself accidentally pressing the button quite often. The fact that you can’t re-program the button to perform a different function (such as open Google Assistant, for example) makes the situation even worse. Samsung is so intent that users get to know Bixby that they’ve gamified things. As you use the virtual assistant, you get points and go up in “levels”. Those points are part of the Samsung Reward program, which lets you trade in points for actual products. It feels a little spammy though and requires using Samsung Pay as well. Bixby itself is an interesting attempt at competing with Google Home and Amazon Alexa, but the most distinguishing feature right now is the ability to tell it what to say when you give it a prompt. So, for instance, you can literally tell it how to respond to a specific joke or what to say when you ask it for your mother’s birthday. It’s a nice feature that I haven’t seen before, but hardly a reason to give up on your other preferred assistant app. The Note 8 is still using Android 7.1.1 (Nougat), as opposed to the just released Oreo update. Samsung, as usual, has tweaked the UI a bit here and there to be a little different than straight up Android. You can’t double tap on lock screen notifications to access them, for instance. Instead, you tap on the notification once and swipe up. It’s little things though and the phone doesn’t feel bloated with unwanted apps as in past Samsung phones. Finally, the Note 8 only comes with 64GB, which honestly feels a little light nowadays. It thankfully has an SD card slot for expansion, but it still would have been nice to offer a larger storage option considering that the Note 8 is meant to be for power users. Another carry-over feature is water resistance, coming in at an impressive IP68 rating. It’s the same as the Galaxy S8’s rating, but it’s better than most smartphones on the market. Admittedly, the biggest deterrent for upgrading to the Note 8 might be the price. At $930, all the quality and high specs don’t come cheap. The pricetag puts it directly in competition with the iPhone X, which has a bit more of a futuristic vibe to it. All of this might mean that the simpler, cheaper Galaxy S8 might be the better choice for some. However, if you’re looking for the best of the best, the Note 8 is easily the most impressive phone we’ve seen so far this year and one of the best Android phones you can find period.